Sometimes you just craaaaave comfort food, am I right? One dish that always finds itself comforting me, in the midst of chaos and craziness, is a whole roasted chicken. There is something so soothing about taking a whole bird and without much effort, transforming it into an amazing (and nourishing) dinner. Little fuss, lots of flavor. Plus roasted chicken is so versatile. It's like soup- something you can make absent-mindedly and with whatever ingredients you have on hand at that time. These two comfort food staples are my go-to's when I just need to give my brain some time to sort out everything on its own. Recently though, I haven't even had the time to properly roast a chicken. Which kind of bums me out. Plus, with our crazy Southern California weather, we haven't had much of a winter as of late. It's felt a lot more like summertime here which means the oven is rarely on. Still craving this comfort food staple, and needing to let my brain digest and process, I tried my hand at crockpot "roasting". Friends...holy cow. Amazing. I scavenged around my home looking for some inspiration and came across a few leftover Meyer lemons and some fresh sprigs of rosemary from our little patio garden. I gathered everything up and let my brain go. Ahhhhh... For some reason I feel like crockpot foods always need a lot of liquid to cook properly, so I was a tad timid to cook a whole bird this way without any. My goal was to get it as close to the oven roasted kind as humanly possible, while allowing the crockpot to do all the cooking AND all the while saving us from more heat during these hot weeks. The result? An incredibly moist and flavorful bird. And one that I can throw in during a spare minute in the afternoon and leave to do its thing until later that night. Of course, because of the lack of direct dry heat an oven would give off, you miss the roasted crispiness. Bummer. BUT what it lacks in that department it totally makes up for in ease, deliciousness, and juiciness. It's so juicy! When this dish is done, you're left with a bird whose meat is literally falling off the bone. Plus, crockpot cooking has a way of pulling out a foods' natural liquids, so you're left with some of the most amazing juices at the bottom of the pot. Use as a dipping sauce, poured right back over the sliced meat, or quickly make a gravy with the stuff. Whatever you do, make sure to use it up because it is ridiculous. Grab these 4 ingredients, throw them together, sit back, and let the crockpot do the work for you. 1. Remove the tops and bottoms off of the Meyer lemons. Cut into 1/4" thick slices and remove any noticeable seeds. 2. 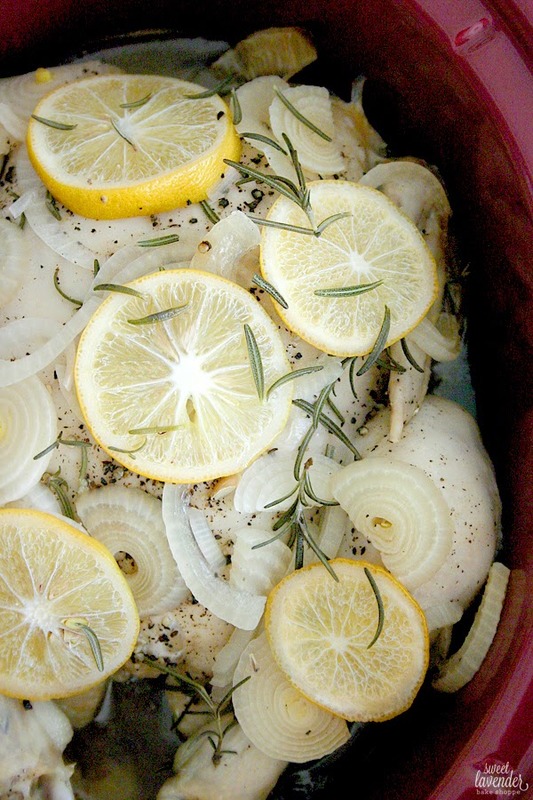 Into the bottom of your crockpot, layer half of your sliced onions and half of your Meyer lemon slices. Remove rosemary from it's stems and sprinkle half on top. 3. Thoroughly salt and pepper the entire chicken, inside and out (make sure you get into that cavity!) and place on top of your lemons and onions. 4. 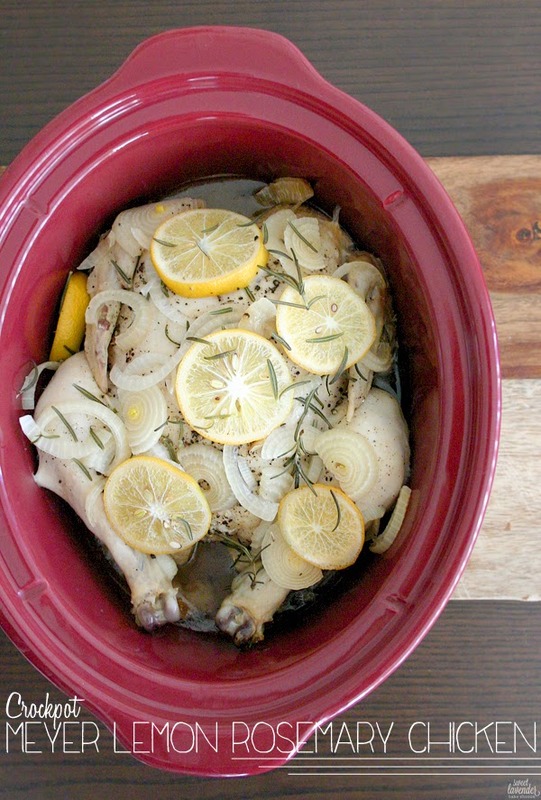 Next, top the chicken with the remaining onion, lemon, and rosemary and cover with your slow cooker lid. Cook on high for 3-4 hours, or until the meat pulls away from the leg bones. 5. Cool in crockpot for 15-20 minutes before carefully removing. It will want to almost fall apart. Then, simply slice up and serve! Juices can be used to make gravy, sauce, or placed in an air tight container and saved for future recipes. Skim any extra fat that has collected on the top of the juices, with a spoon and discard or save for future sautéing or frying! It's delicious fat! So easy and SO yummy! I hope you do! Oh poor you! I'm so sorry to hear about your exhaustion :( Hope you feel better soon. I love a good crockpot recipe! So easy for the work week. For some reason your posts weren't showing up in my feed! I've been missing out! This chicken looks so good... the weather here continues to be nasty cold and any sort of comfort food is high on the list. yum!